I quite like champagne. Growing up we only had champagne a few times, and my mom was very particular about what was acceptable champagne. The real stuff—not Prosecco or Crémant. And Brut. She was big on dry champagne. Anyway, I have to say that getting a bubbly cocktail sounds fun, and while I know it is popular to use champagne for bubbles, it always struck me as a job for cheap, sweet champagne. The stuff you wouldn’t drink right out. For this cocktail I was pretty limited with which I could use because I wanted only a split (half bottle) instead of a regular bottle, because I can only drink so much in one night and take coherent notes. I picked up some Brugnon Brut, which is a fine, if not splendid (and outrageously expensive), champagne. Oh, and yeah, I don’t have champagne flutes, so I used a wine glass. If this really bothers you for some reason, I’m totally open to receiving gifts. Cafe Royal and Savoy omit the apricot brandy, make the cognac optional, and add an orange slice and lemon twist. I’d say that overall this is a fine drink. 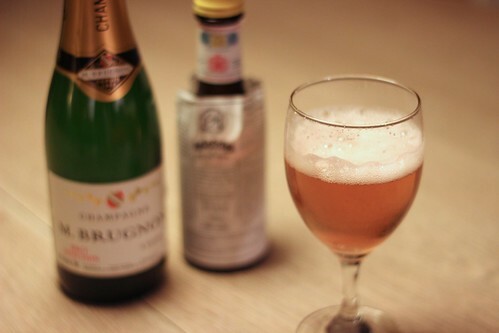 It’s a nice twist on champagne, and the bitters and slight sweetness don’t overpower it., and add a little complexity. I don’t feel strongly about the addition or lack of apricot brandy. It serves to sweeten the drink a little more, and in that regard I’m not surprised that Lommebogen had things a little sweeter than Cafe Royal and Savoy. That said, I think I’d prefer to just drink the champagne straight. I think the only champagne drink I really enjoy is a French 77 (not the 75), which uses elderflower liqueur, and I think that is only because I have a definite weak spot for St. Germain.